"Qubits encoded in the spins of electrons are especially long-lived in silicon, but they are difficult to control by electric fields. Spin-orbit interaction is an important knob for the design of qubits that was thought to be small in this material, traditionally," explains Assistant Professor Rajib Rahman, research assistant professor at Purdue. 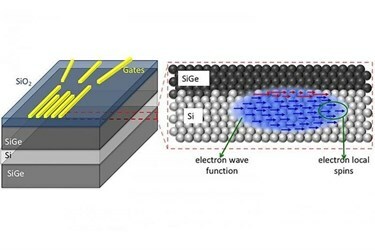 The researchers found more prominent spin-orbit interaction than usual at the surface of silicon where qubits are located in the form of so-called quantum dots - electrons confined in three dimensions. Assist Prof. Rahman's lab identified that this spin-orbit interaction is anisotropic in nature - meaning that it is dependent on the angle of an external magnetic field - and strongly affected by atomic details of the surface. "This anisotropy can be employed to either enhance or minimise the strength of the spin-orbit interaction," adds Rifat Ferdous, lead author. Spin-orbit interaction then affects qubits. "If there is a strong spin-orbit interaction, the qubit's lifetime is shorter but you can manipulate it more easily. The opposite happens with a weak spin-orbit interaction: The qubit's lifetime is longer, but manipulation is more difficult," Rahman says. The researchers intend to focus on taking advantage of the anisotropic nature of spin-orbit interactions to further enhance the coherence and control of qubits, and, therefore, the scaling up of quantum computer chips.